Mary Kimball, also known as Mama Kimball has been a practicing pagan for well over 25 years. She has not only been a member of the CWPN, Inc. but has served on its Board of Directors by holding the positions of President, VP, Treasurer and Area Rep as well as being one of the people who incorporated it into 501c3. She also chaired the CWPN’s Harvest Gathering after being on its staff for many years. 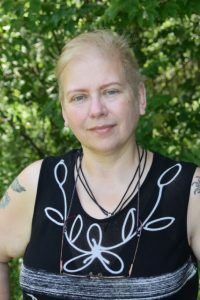 Mary has a number of years of experience in teaching classes and workshops as well as creating and performing personal and community rituals. Besides her day job, Mary owns and operates Mama Kimball’s Emporium in which she makes one of a kind clothes, jewelry and other items of interest. She is also a Justice of the Peace and a Notary Public in the State of CT for over 15 years.